Manual Sorting. Now you can directly manipulate the displayed order of items by dragging them to a new position. Very useful together with batch rename operations. Of course, the same can be done also in thumbnails view. So you can, for example, drag your photos to new positions just like on a light table, and then apply a batch rename. Manual Sorting is also known as arbitrary sorting. 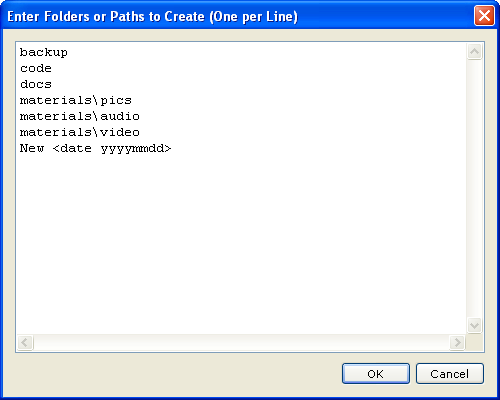 For example, the following simple lines define the user button context menu shown below. "Custom Keyboard Shortcuts|:cks" button "cks"
"Edit User Commands|:udc" button "udc"
"Exit w/out Saving|:exitnosave" button "exitnosave"
New Folders. Now you can enter a list of new folders or whole new paths that will be created in one go. 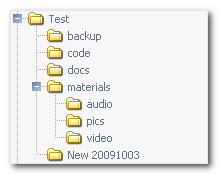 The following list of relative folders, entered in current folder "Test", will create the branch structure shown below. 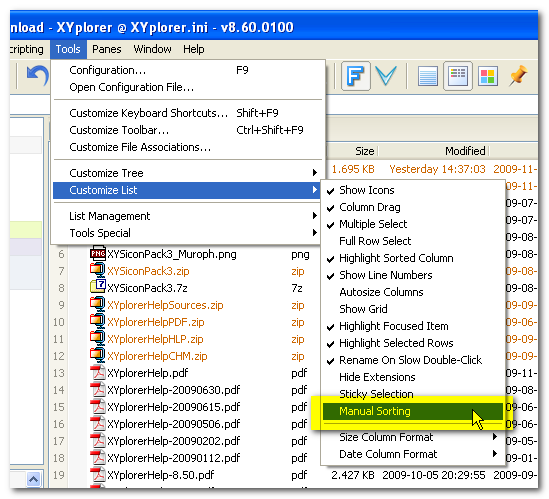 As you see also multi-part sub paths are created, and variables are supported (XYplorer native and, not in the above example, environment). Tabs. Now you can opt to display just the child folder names in the tab headers. Saves loads of space. Icon can be any file or folder; its small system icon (the one you see in Details View) will be used for the menu. 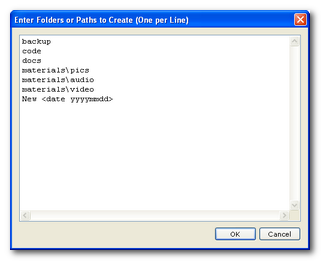 For example, the following script will generate the popup menu you see below. "Open with EmEdit|Desktop\Kiss me, too.ico"
Full Screen Preview/Thumbnails. Added file formats DWG and DWF (Vista/Win7 only).